Are they bearings or bushes? 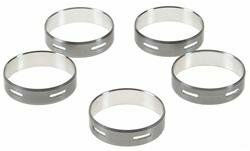 Cam bearings, so as main bearings shells but a complete circle. You may well get them out but only if using the correct tool, however for piece of mind, given that this is a full on rebuilt with excellent parts, I would get a new set when you know what is required. Have you measured the very front cam journal, this should be relatively easy, you can then measure the front cam bearing insitu and see what they come out at before you start to extract the bearings. I realise that that would only be one journal but might give you an indication of how far out the tollerance is. To be franmk I have never had an issue when installing new cam bearings and fitting a cam afterwards, a little fiddley but always have managed to fit in. Have done a few Rover v8's, Ford Pinto's etc. but not a big block Ford. Lastly have you been in touch with the supplier to see what they have to say, if you got the cam bearings and cam from the same place I would have assumed that they would have sized them correctly for the block you have, generally blocks are blocks are blocks, whereas cams can vary depending on supplier/manufacturer. Personally I have never heard of a block having the cam area resized but there again maybe this is something racers do regularly and I just haven't heard of it in my circle of friends. The block, cam and bearings all came from different places in the States. I've spoken to Middex Re-boring and they recon they can sort things for me. Just got to get some more bearings. They are bushes. The shrink once they are set in the housing. How do I know... We have bushes made for transmission and the engineering co always asks for housing and shaft to calculate the tolerance. Even taking the measurements from the OEM ones does not ensure they are right. I think I would have run a broach up them and seen how it went. Nothing to loose. It could be a matter of microns that causing your problem. Best to leave it the experts who have the machines to sort it out. Last edited by fad15; 09-10-18 at 06:03 PM. It's one of those things when you have to buy stuff from abroad then find it doesn't fit. They have it easy over there, every town has one or two engine shops and easy access to parts. I can only think of a handful of proper engine builders in the whole country over here. Also a big block is a lot of iron to have to move around, almost 300lbs. Will do some more measuring at the weekend and see what happens. All sorted. All 5 are the same size but the cam tunnel tolerances were at the low end so compressed the bearings when installed. SERDI in Uxbridge honed the tunnel for me and fitted new bearings. All working fine now.